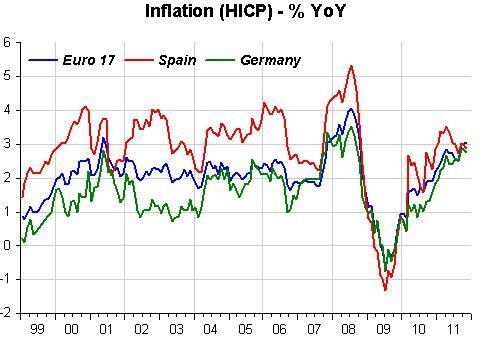 As the figure shows, Spanish inflation has been higher than the EZ average, but German inflation has mostly been very close to the average since 2004, so it doesn´t appear that “slow-growers like Germany suffered from an excessively tight policy”. 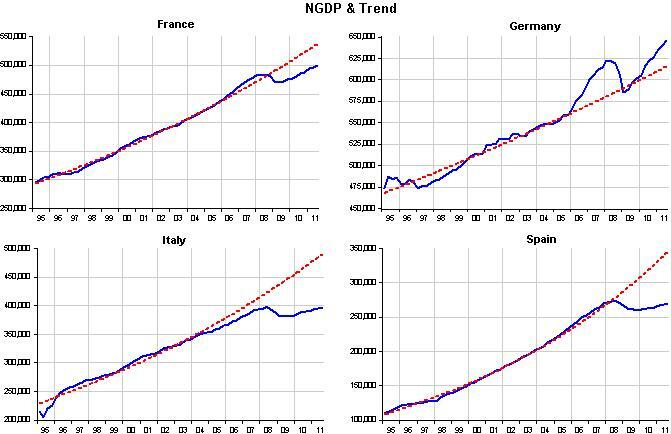 The panel below indicates that, with the exception of Italy, ECB policy kept countries NGDP growing very close to their trend path (estimated from 1995 to 2005). But notice that after the labor market reforms of 2002-04 (that resulted in “wage moderation”) Germany´s NGDP “shoots up”. The next panel shows that ECB policy begins to tighten at that very moment. As the inflation chart above show, inflation came down everywhere. But in mid 2007 the oil and commodity price shocks happened. 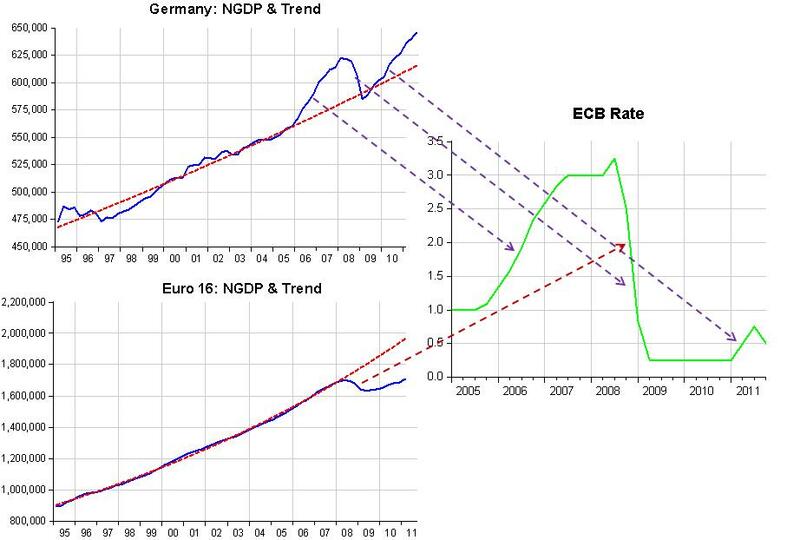 The ECB had already ended its “tightening cycle” but in July 2008 decided that more tightening was called for! An error that may have helped nourish expectations of falling incomes at the same time that monetary policy errors in the US were about to unleash the “Great Recession”. Soon after it had to reverse direction. Scott puts up a chart comparing German and US unemployment. 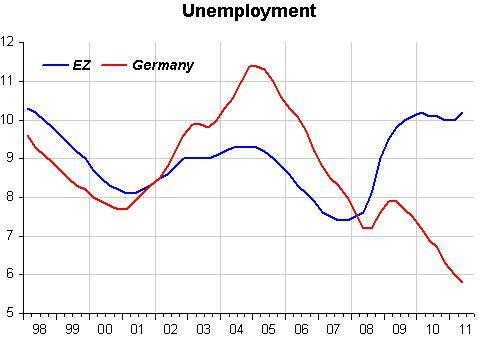 But the right comparison is between German and Eurozone unemployment. The chart below shows that except during 2003-07 German unemployment was below the EZ rate, falling fast after the labor market reforms of 2002-04 took effect, continuing to fall after the crisis. I pushed back politely. Look, I said, it’s not Greece I’m worried about. It’s Italy. Third-biggest bond market in the world. Bond spreads this morning again heading over 7% (before the ECB intervened this to push them back down again.) Too big to fail, too big to save. Is the government, even one under a new Prime Minister, going to push through sufficient austerity to avoid a default? I am with you on this one. Seems so clear to me. Japan has an extremely strong yen. Japan has had 15 percent deflation in the last 20 years. Japan’s manufacturing output has fallen 20 percent in that time period, while stock and equity markets cratered by 80 percent. Banks suffer continual losses on real estate and loans in nominal yen. You call that “theo-monetarism.” A faith that an undefined, oblique, ad hoc “tight money” policy works, despite abundant empirical evidence to the contrary. Pingback: Država je kriva za sve (5) | Tko je John Galt?